The habit of eating out is catching on with the general masses, and it is going beyond fine dinning and fast food joints. 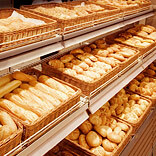 The latest buzz in town is the bakery chains that are offering a wide variety of items to choose from. These glitzy, aesthetically and tastefully decorated bakery café/restaurants that resemble a boutique more than a bakery outlet would serve you anything from break fast to lunch to in between snacks, much unlike the traditional items which are served across India from signature sandwiches, healthy salads, hot soups, steaming coffee and a whole range of baked food products, but with a panache! Looking at the Indian consumers the bakery chains that have entered India in the recent past have modified their menus according to the culture and local palate in mind like Bread Talk adopted the local food traditions and customised its product with fillings and flavours that change from country to country. Au Bon Pain has introduced equal number of vegetarian dishes along with its non vegetarian menu and another bakery chain Cinnabon has added eggless items, since most of the Indian do not eat egg. The target consumers of these bakery chains are primarily families, college students and executives. Banking heavily on the sweet tooth of Indian consumers, Cinnabon entered India and primarily wooed women and college students. According to Naveen Madan, Brand Manager at Cinnabon, “Indians overall not only have sweet tooth, also sweets make an ideal gift for any occasion. Moreover, Indians, can relate to the taste of cinnamon. These reasons are enough to believe that Cinnabon would be very successful in India,” said Madan. The Singapore based Bread Talk has come up with the concept of see-through kitchen or visible cooking area, which are mostly behind the sales counter or hidden from the consumer’s visibility, the message is clear that their outlets are with hygienic ambience, and broadly targets the upper zone of discerning consumers. He further said, “We are pleasantly surprised to see that we are getting a variety of people from all age groups.” According to him bulk of the customers visit the café at least three to four times a week and they generally tend to bring their family and friends along, most of the time. Au Bon Pain started its Indian operations in Bangalore and has three retail outlets as of now, which were strategically opened to capture the maximum footfalls. Ideally, Au Bon Pain outlets have1500 sq. ft. of area but there are outlets as small as having 200 sq. ft. of area and as big as sprawling across 2000 sq. ft of area. While, Cinnabon follow the standard international bakery format, that is, 800 sq, ft. for each of its outlets. Two of its retail outlets are in Delhi. One is in Mumbai and another retail outlet would be opened shortly in Mumbai. Bread Talk has over 200 outlets around the world, and entered the market through Crustum Products Pvt. Ltd. They opened their first retail outlet at InOrbit mall in Mumbai and only focus on standalone mall outlets. For Au Bon Pain, Au Bon Pain India Pvt. Ltd. holds the master franchisee rights and have no intention of going for a sub-franchise route. The chain has invested around Rs 40-50 lakh per location. It is planning to open 10 outlets each in Bangalore and Hyderabad in March 2010-2011. Ten more outlets will be launched in Chennai in March 2010-2012. “We fall into a very premium bakery segment. Our aspiration is to become the only restaurant in the premium bakery segment to have a pan India presence. Currently we are looking at expanding our presence in Bangalore and in South India. Only at the later stage, after we consolidate our position down south, we will be moving into the other metros,” said Kannur. Bread Talk has invested a capital of Rs 75-80 lakh for each outlet and is only targeting institutional sales as it believes, that’s where the big money is. Meanwhile, Monginis hopes to derive about 20 per cent of its revenues from this category of products. There are 180 Monginis cakes shops in Mumbai city alone and are targeting to open 200 stores in Mumbai by the year-end. The company’s focus is mainly on West and East India, with some outlets opening in Central India as well. The expansion will be funded by internal accruals.